October was blistering hot, bone dry and in general not a great place to be if you are at the bottom of the food-chain. There is almost nothing green left to eat and water is hard to come by. Carcasses are scattered around the bush at this time of the year. Buffalos and hippos suffer more than most while the top-of-the-chain carnivores thrive in these conditions because there is a lot of free food to go around. Mother Nature has many magic-tricks up her green sleeves, some more obvious than others. The way in which she makes dead animals disappear must be one her most impressive pieces of work. 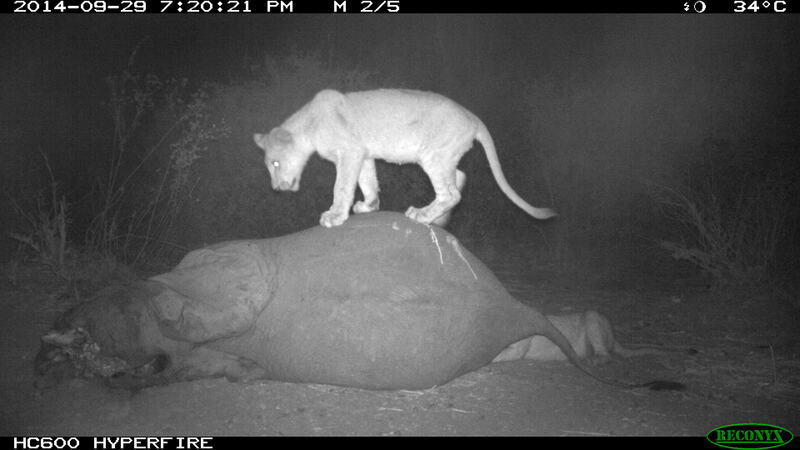 We recently had a dead elephant in front of Wildlife Camp (close enough to see the vultures landing but far enough not to smell it) and that gave us a chance to chronicle the bush at its most efficient. Sunday: It was a Sunday morning at 10:00 when the elephant died – she was a young cow of about 8 years weighing almost 1500kg. She had bad wounds and was eventually euthanized by Zambian Wildlife Authority. The carcass lay in the open, surrounded by white-berry bush and the sweet smell of wild-jasmine. Her small tusks were removed so they don’t end up in the wrong hands. Because the carcass was out in the open it took only 20 minutes for a yellow-billed kite to swoop down onto it. The areas where the tusks used to be provided small pickings of meat and the eyes were pecked out soon after. Within an hour the kite was joined by white-headed vultures, white-backed vultures, hooded vultures and marabou storks. But an elephant’s skin is too thick and tough for them to open so they sat around discussing the weather and politics. Insects play a bigger role at carcasses than most people think. 3% of a carcass can be devoured by maggots and their mates. They started early and as the sun set that afternoon thousands of insects have made their way to the site. 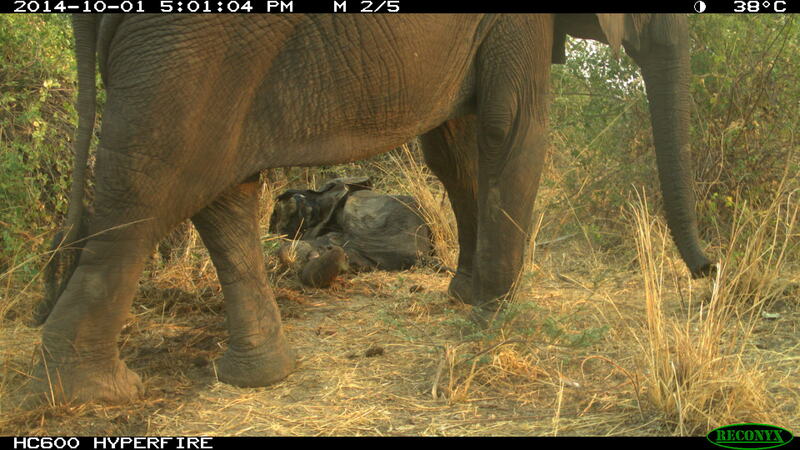 Studies done here in the Luangwa Valley revealed that beetles can travel as far as 1km to get to a carcass! 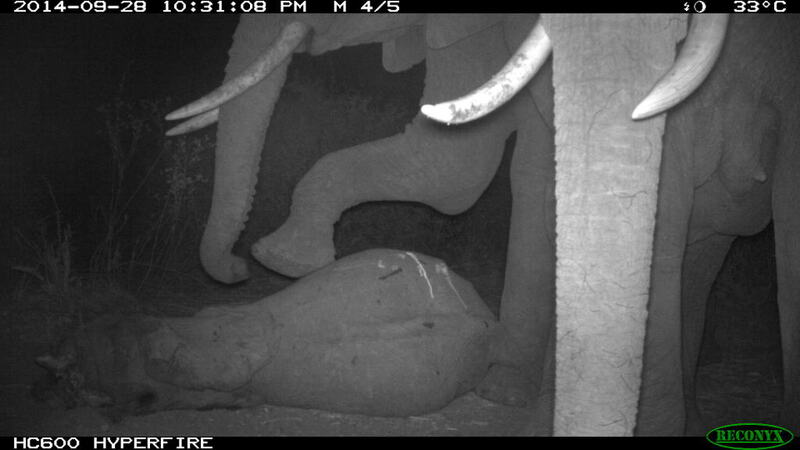 Our camera trap reveals that that night a herd of elephants stood guard over the carcass, caressing it with their trunks and nudging it with their feet to try to make it stand up again. They left after two hours only for another herd to do the same just before a new day broke. At 5:20 the first vultures arrived back from their roosting spots, hoping that something had opened the carcass overnight. But nothing did. Monday: Seeing as the skin had not yet been penetrated, the vultures could not do much with the carcass and soon some of them left. They had arrived at about 18:25 that Monday evening – two females and three cubs. One would think they’ll start with a feeding frenzy right away but that wasn’t the case. 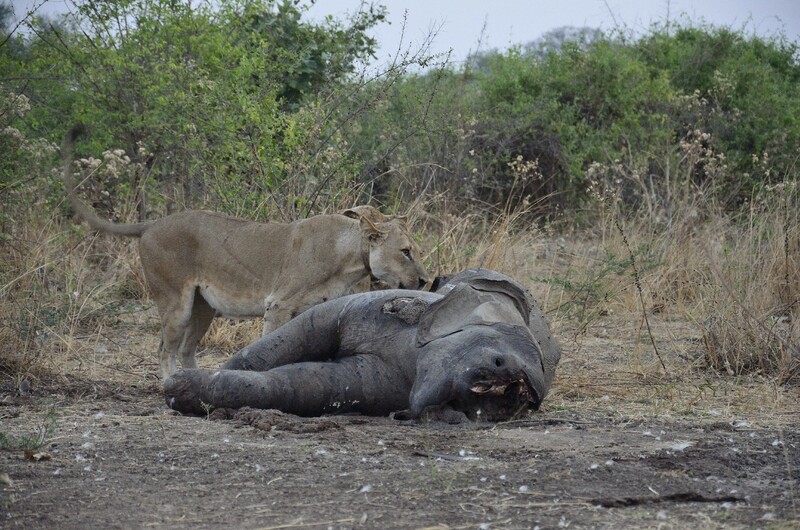 The footage reveals that the two females circled the carcass for about 20 minutes, obviously nervous as they did not know who or what the meat belonged to. They then disappeared for about 20 minutes and when they came back they had the cubs with them. The youngsters approached very carefully, almost in a stalking posture – the previous elephants they’ve met have never been friendly towards them. Again the carcass was circled several times before one female ripped open a piece of soft skin close to the tail. Now the frenzy was on it continued until 22:55 that night. Time for bed – but they slept with one eye open guarding their prized possession the rest of the night and nothing else got a chance to feed. And that is how I found them the next morning – well fed yet grumpy. Tuesday: With the carcass now open the vultures could get in. White-backed vultures have long necks which they stick into every nook and cranny – they can eat 1kg of meat in a matter of minutes. 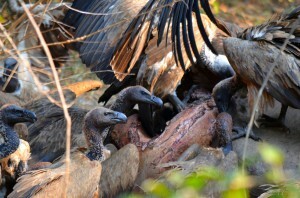 30 vultures mean 30kg of meat, a significant amount from a carcass that was “losing weight” fast. Other than vultures and maggots it was a slow day at the carcass. 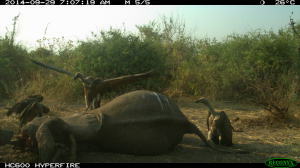 Temperatures rose up to nearly 50°C in the sun so most mammals chose to rest before another long night up ahead. 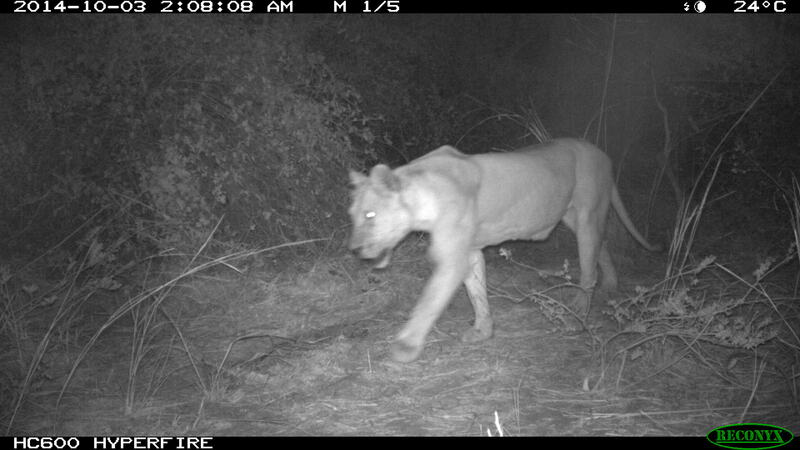 The lions returned just after sunset and did the same as the night before. A few loops around the carcass before the binge. This time they kept looking around and especially the cubs paid a lot of attention to the darkness beyond their domain (and the domain of our camera) – the hyenas were lurking. By 1:58 the lions had had enough and made their way to our restaurant-pond to drink. The hyenas soon marched in, and unlike the lions, started eating right away. One pulled off a leg while another disappeared with the trunk. 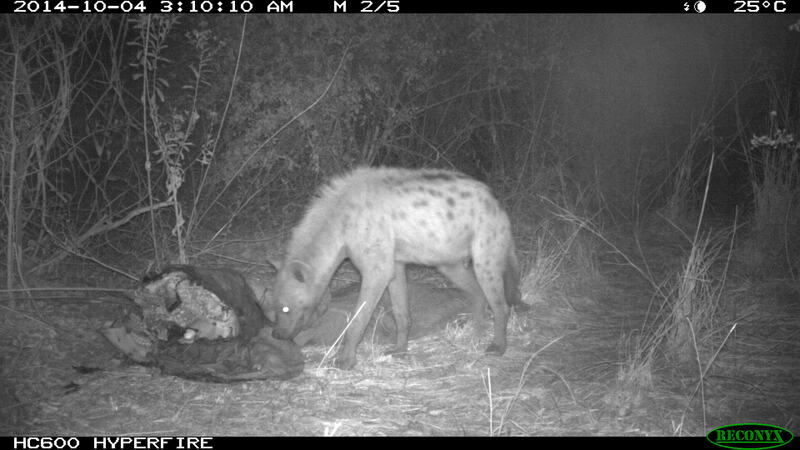 The whole camp was woken up by the crackling laugh of hyenas having a feast. 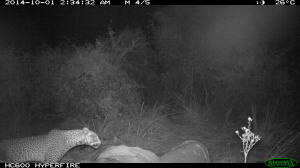 At 2:35 a leopard appeared. She found it a tad too rotten for her taste and left without even contributing one bite to this gigantic effort. 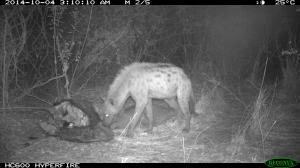 There is fantastic sequence of photos taken at 2:51 that morning showing two hyenas gnawing away at the elephant’s hind leg. 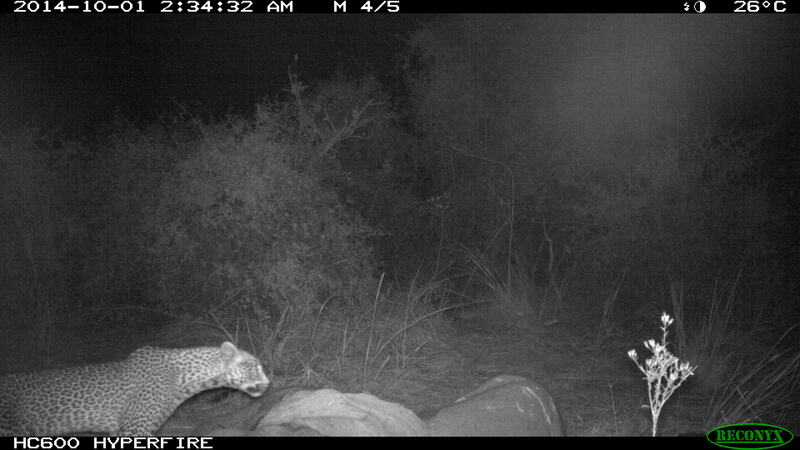 Behind them in the bush the camera pick up two eyes, but the hyenas remain oblivious until a lioness charges out of the bush, scattering hyenas into the darkness. They had obviously quenched their thirst and was back for more. In an attempt the hide the carcass they dragged it deeper into the thickets. Wednesday: The lions stayed with the carcass until just before 7:00 that morning. Guests having breakfast in our restaurant before going to the airport to fly home got treated to one last lion sighting when we drove them down to watch one of the cubs trying to find a dent in the ground large enough to put his big belly in. By now there was not much left of the carcass and the smaller hooded-vultures moved in to pick clean the bones that had been scattered by the hyenas. To one side a lappet-faced vulture, the largest of the Luangwa vultures, monopolized a leg. Throughout the week the elephant herds kept on visiting. We watched as on more than one occasion moving herds suddenly stopping in their tracks. They would stand still for a few moments, all their trunks up smelling the air, before the matriarch would change direction, heading towards the carcass of an elephant many of them would have met before. The lion cubs were back at the carcass again just after 18:00 and the females joined them an hour later. By 2:00 in the morning they had had enough – they moved off and would not go back to the carcass again. Thursday: The day progressed much the same as all the other days. 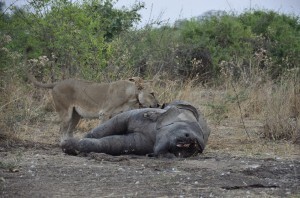 A warthog came to investigate and ate one or two bites, but was obviously nervous – the stench of the carcass was not enough to mask the scent of the lions. The hooded vultures did what they do best, but the larger vulture species had already left. 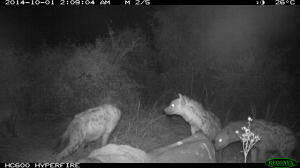 In the absence of the lions the hyenas moved in early evening – once again, we could hear their laughs and cackles all night long as they finished what the lions did not want. Tendons and bones and chewy pieces of skin. But there was not much left and by 3:00 in the morning they gave the last laugh and left. When I got there the Friday morning the skin and skull was virtually all that was left. The smell was still in the air and the buzzing of blow-flies would remain for the next few days. Of course there is much more to this magic-trick than meets the eye, but I do not want to write about things that I (nor the experts) fully understand. But if you want to come and see Mother Nature in action, we are running a fantastic value for money 3night and 5nights special this green season. E-mail us at info@wildlifezambia.com for more details. ps: We currently have another dead elephant close to camp and once again our camera is capturing all the action. Keep an eye on our facebook page at www.facebook.com/WildlifeCamp for photos.